Have you just started your online business? Excited at the thought of reaching new people and expanding your brand? With any new business, you soon learn that it can take a lot of time and effort to make sure it’s successful right out of the gate. There are many moving parts to a business and for solopreneurs, the responsibility often falls on your shoulders to set up, maintain and grow your business. One moving part is content creation. Running your own blog and doing your own content marketing can seem like a daunting and tedious task to undertake. Effective blogging takes time to plan, research and write content on a consistent basis. It also takes skill and forethought with regards to the person writing the blog posts, which most often is you, the business owner. That’s why having an editorial process for your content is important when you are just starting out with an online business. While you may find plenty of advice on the creation process, there isn’t much out there for the entire process of drafting up an idea all the way down to managing your blog for the long haul. 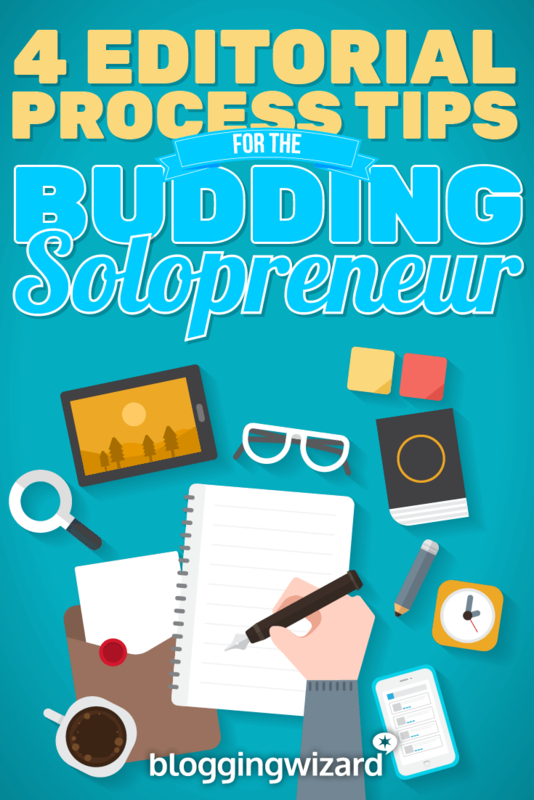 Whether you have a solid editorial process or looking to adopt one, here are four tips to help out any budding solopreneur. Having to always come up with interesting blog topics can be hard for someone whose strong suit might be marketing or bookkeeping. Writer’s block can impede any creative juices, and it’s not unusual to see many inactive and abandoned business blogs on the web. While you can always repurpose your content or post less frequently, a better option is to have a list of content ideas always on file. Using a tool like Evernote or Trello can easily make drafting up a blog post a quick and painless process. Let’s look at some things you can do so you never run out of blog post topics. Buzzsumo is a content analyzer tool that uses social sharing to track popular types of content. You can enter in your keyword or industry niche and see what is already popular on social media. You can use this data to think of blog post ideas that you know people will enjoy since similar topics have done well in the past and have high social share totals. When writing for your business blog, make sure you are writing to attract your buyer persona. And a great way to ensure that every blog post you write is tailored towards your ideal customer is to ask the readers themselves what they want you to write about. Bryan Collins of Become a Writer Today did this by sending out a survey to his readers. He then went on to post these results on his blog addressing each survey question. As a solopreneur, this is easy to do. 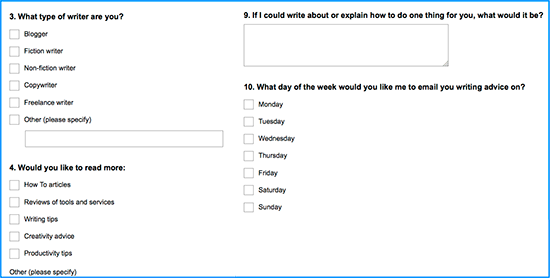 You can create your survey by using an online questionnaire service like SurveyMonkey. From here you can email your subscribers or have a link to the survey at the end of each of your blog posts for a period of time. You can even ask questions on other types of data such as which social media platform they frequent the most, on what day of the week they prefer an email from you or what their hobbies are. With all this newfound data you can tailor your blog posts to your readers, narrow down the best times to publish them, and even learn the best social media platforms on which to promote them. 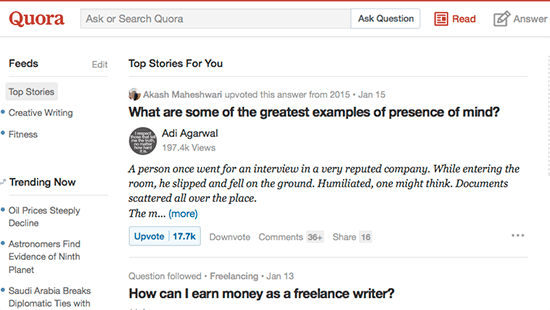 Quora is a socially driven Q&A-type website where readers can ask questions and answer other people’s questions. 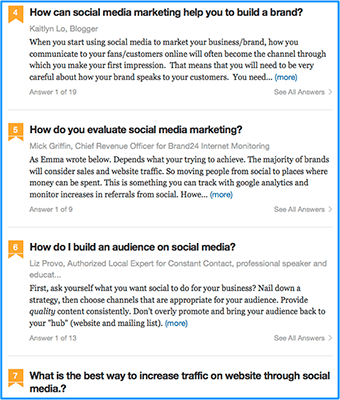 From here you can plan your content – and your content schedule – to address these questions. Have you ever landed on a blog post, read it and thought this is bad? While not every blogger has the best grammar or spelling, the biggest issue you see with bad blog posts is a weak or poor flow. Ideas skip around, main points are jumbled up with secondary points, and then it all circles again for the conclusion. Creating an outline before you begin your blog post is just a good practice. On the plus side, you end up writing faster and better. Outlines give you an overall structure to your content, and it can help you flesh out ideas better and keep you focused so you’re not going off on tangents. In a couple of sentences, explain what the blog post is about. This is part of the brainstorming process where you are gathering topics and ideas to form a blog post. For some bloggers, the headline doesn’t even come around until they finish writing their piece. For others, they must have the perfect headline before they begin. When you come up with a headline – or several headlines – make sure they are specific and they speak to your audience. The best blog posts are the ones that have actionable advice. So, having a problem common to many of your readers – that you then discuss in your blog post – would appeal to your audience. In your outline, write out the problem you’ll be focusing on, and also how you’re going to solve it. List and provide several bullet points for each subheading topic. This can change once you finally get into the actual writing process, but it’s a good starting point. Every blog post you write should have a call-to-action. Maybe you want your reader to sign up for your newsletter or download your content upgrade offer. Or maybe you want to propose a question to your readers. Thinking of your CTA in the ideation phase will help you keep your blog post aligned with whatever the end goal is for your blog. Before you hit that publish button, make sure to have an outside source take a second look at your content. While most people aren’t adept at catching their own editing errors or spelling mistakes, a great thing to have in your back pocket is an editing tool like Grammarly. It can easily spot editing mistakes and spelling errors, and it also helps with making your sentence structure flow better. Grammarly not only looks over your grammar, but it can also detect plagiarism and check for overuse of common words. Use Grammarly for free either through their website or as a Chrome extension. Both of these free options do have their limitations. 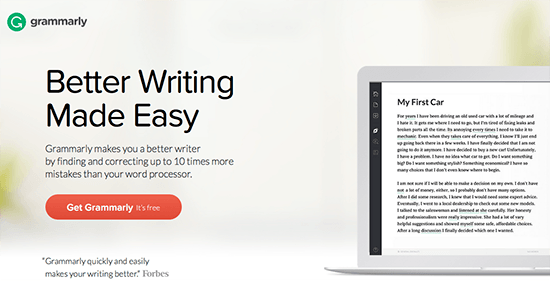 So, to get the best out of Grammarly, sign up for their monthly plan, starting at $29.95. As a solopreneur you can’t do everything yourself. The chronic stress, endless to-do list, and potential health concerns (from stress and sitting) will become daily occurrences unless you find a way to work less or more efficiently. But this doesn’t mean you should stop blogging or posting content. It might mean you will eventually end up posting less frequently – or posting shorter content, however. Your blog does help your site get indexed quicker, and it gives you audience something to connect your brand and business with. In truth, it’s best not to go at this alone. Instead, outsource and delegate blog management to free up more time. Figure out whom you need and want as a writer, copywriter, blog writer, or ghostwriter, and hire it out. But, where can you go to find a reliable freelance writer? There are three approaches you can use depending on your timeline and needs. One way to find exactly what you need is to post a job ad on a freelance writing job board like Problogger. It’s a quick approach, and you can often find a quality writer within the first 48 hours after posting your job ad. When drafting up your job ad make sure to include the scope of the project. This helps define what you want a freelance writer to do for you. If taking the time to draft up a job ad – and then sorting through the hundreds of applicants’ emails – is too time-consuming, using an agency might be a better option. Small agencies can help alleviate tasks that take up too much of your time, or ones you just don’t want to do anymore. The biggest difference in using an agency over posting a job ad is they handle most of the backend work for you. So they can match a freelancer based on your needs. Take NerdyGirl for instance. They are a concierge service that lets you focus on your business while they take care of your email, web copy, blog, or social media marketing. Find a package or service you want and fill out their contact form to get the ball rolling. A final way to find a freelance writer is to pay attention to what you are reading. While this approach takes the most time to find a writer, the time and effort you put into checking out freelance writers will often result in better quality work. Sites like Kissmetrics, Blogging Wizard, Smart Blogger (formerly Boost Blog Traffic) and many others have multiple authors posting on their blog. If you come across a blog post you enjoy, check out the writer’s author bio and their website or social media profiles. From there you can get a feel of whether a particular writer would be a good fit for your business. All that’s left is to contact them and ask if they are interested in collaborating with you. If you find that your content is falling by the wayside, a quick fix might be to consider adding a new step in your editorial process. Or, you can include an outline to streamline the creation process making it easier to come up with a complete blog post idea before you even write it. This makes your writing stronger and cuts down on your time commitment so you can focus on other parts of your business. And using an editing tool like Grammarly can instantly turn your writing into a more polished and better flowing piece. Finally, if you’re finding that the dedication it takes to maintain your blog is too time-consuming – or not within your skill level – consider outsourcing content creation.